The Dwarkadheesh Temple is the main focus of the Dwarka city. The temple in existence is 7 floored and 45 feet above the sea level. As maintained by the historians, the current temple was renovated amid 1593 and 1606 during the reign of Mughal ruler Akbar. However, a branch of historians are of the opinion that the temple is around 1200 years old. There are four parts of the temple premises. The main attraction here is the 52 yard saptarangi dhwaja with seven primary colors flag. This flag is hoisted four times a day. Dwarkadheesh temple is also popularly known as Triloksundara temple. The temple is constructed in Chalukya style. The stones used in its construction are hewn style owing to the presence of saline air. The main gate is known as Moksha Dwar through which all the devotees enter inside the holy abode. As per the ritual, the devotees are required to have a spiritual bath in the River Gomti before entering the temple premises, via Swarga Dwar entrance. This is on the side of the River Gomti that flows behind the river. Again, the 56 sidis (steps) present here have a religious significance as they represent 52 Yadava of the administrative divisions and four gods – Krishna, Balarama, Pradyuman and Anirudhha. Lord Dwarkadheesh or Lord Krishna is the main deity inside the temple. The idol is black in color and has a mythological importance behind its existence. The idol was first propitiated by Queen Rukamani and later it was officially installed by Shri Vallabhacharayajee at Ladva village. During those times there was a trend to veil the idol of the deity in a step well, known as Savitri vav, in order to save it from the Muslim aggression. Hence, when Shri Vallabhacharyajee witnessed the temple without any deity present in it, he installed an idol there. When Turk Aziz attacked Dwarka around 1551, the idol was taken from the shrine to Bet Dwarka and after few years it was reestablished in the temple. As maintained by a branch of historians, in the year 1559, Shankaracharya Shri Anirudhacharya had made an idol at Dungarpur and established it in a separate room after the renovation of the whole temple. 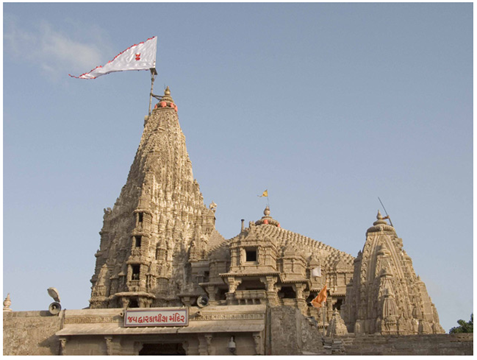 A 52 yard long flag or Dhwaja is a unique feature of Dwarkadheesh temple. It is popularly known amongst the devotees as Dhwajaji or Shriji Dhwajaji. It is recorded as the longest flag in the world and is hoisted 4 times every day. The silk made Dhwaja has many flag cast in gold. Many replicas of the Dhwaja are sold in the shops around the vicinity of the temple. The buying and rising of the Dhwaja on the temple costs around 10,000 rupees and this process includes dakshina to gugali Brahmins. For the next few years the list of the devotees offering Dhwaja to the Lord has been already booked. Why is it 52 yard long? 56 koti yadavs used to run the administration in the Dwarka ruled by Lord Krishna. Each koti denotes each subdivision of administration. Chaturvyuha is an incarnation of Lord himself and Balaram, Lord Krishna, Pradmyumna and Aniruddha are his incarnation. As mentioned in our ancient Indian Scriptures, Chaturvyuha is the one who has donated purushartha, dharma, aarth, kama & moksha in human life. If we deduct Balaram, Lord Krishna, Pradumyna and Aniruddha from the 56 koti yadavs, the rest of the fifty-two koti indicates the residence of the yadav administrators of the 52 divisions. 52 yards Shriji Dhwaja is a tribute to 52 Dhwaja of different yadav koti. Janmashtami is the main festival celebrated at the Dwarkadheesh temple. People from all parts of the country rather the world congregate here to get the holy sight of Lord Krishna and seek his blessings. It is highly believed that Lord Krishna gives his holy darshan to all his devotees on this day. Special puja is being performed by the Abhoti Brahmins who are in this profession since time immemorial. Right at 7 am in the morning, daily rituals are performed including abhishek snan, mangla arti, shringarbhog, shringar, shringar arti, rajbhog, anosar, madhyahan bhog, utthapan. At around 5 in the evening, shayan arti and shayan bhog are specifically performed. At 9:30 pm in the night, the darshan is closed. 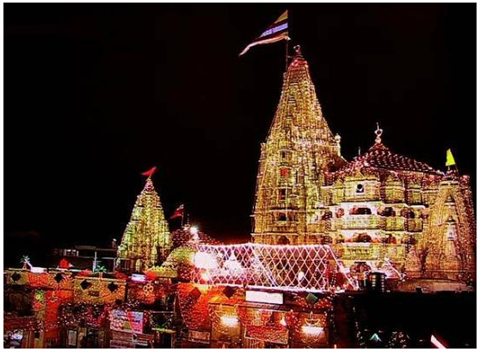 Again, around 11 pm in the night Lord Dwarkadheesh darshan gets open during the festival of Janmashtami. Lord is adorned with different expensive jewelry and ornaments including topaz, diamonds, and valuable stones. Utsavbhog is offered to the Lord at approx 11:30 pm, devotees pamper their beloved baby Krishna by singing in chorus the ‘Nand Gher Anand Bhayo- Jay Kanaiya Lal Ki’. At 2:00 pm, Mahabhog or annakut is offered to the Lord and again after offering the mahabhog around 3:00 pm. the doors are closed.